The Audi R18 e-tron quattro n.2 is the prototype with which Marcel Fassler, Andre Lotterer and Benoit Treluyer participated in the 2014 World Endurance Championship. The main changes compared to the Audi R18 2013 are, a revised engine with an electric turbocharger, updates to the hybrid flywheel system with the addition of a waste heat recovery system. The system captured the thermal energy from the exhaust by adding power to the turbocharger or flywheel storage system. The aerodynamics has been heavily revised according to the new rules, abandoning the diffuser aspirated by the 2013 model forbidden by the regulation. 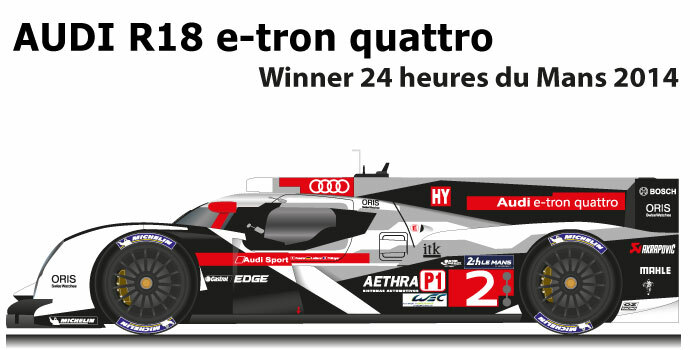 Despite being inferior in performance to the Toyota TS040, the Audi R18 e-tron quattro n.2 won the 24 Hours of Le Mans 2014. The victory came taking advantage of the usual problems of the Japanese manufacturer in the French race. During the season of the championship, Fassler, Lotterer and Treluyer also won the 6 hours of Circuit of the Americas. Drive Type: Rear wheel drive, all wheel drive word hybrid statemi on the front axle.